The Google site search plugin allows you to display target content from your website without the need to develop a complete JSON API. This makes the whole process of integrating web content into your chatbot much easier. Google also crawls websites for new content very regularly, which results in swift updates of your bots content. One thing we love, is that the plugin supports parameters provided by the User Input plugin. 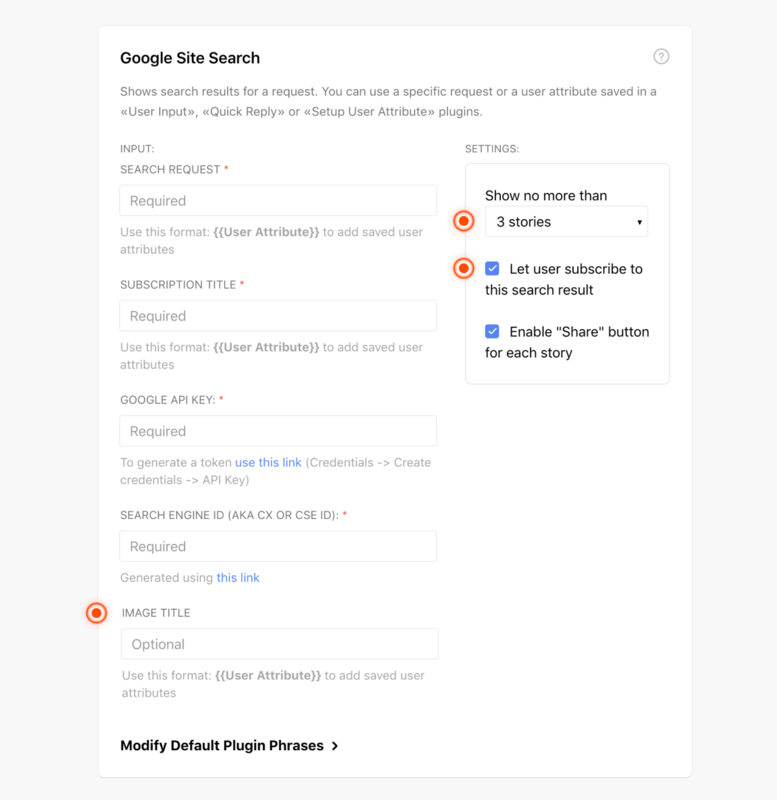 This is great to provide search functionality and show your users the exact content they are looking for. To start we will need to click the link provided right below the CSE ID field. On the next page click Add, specify the website(s) your bot should search on and adapt the search language if needed — then click Create. You will then need to click on the Control Panel button and copy the value for your search engine ID by clicking the corresponding button in the Details section. This is your CSE ID you can now paste into your bot’s Google site search plugin. Please open the link shown right below the API Token field. On the next page click Create project in case you don’t have created one yet and follow the instructions. If you already have a project, you can go on to the next step. Now click on the Enable button and then select the Credentials tab in the left bottom. There you will need to create new credentials by using the Create credentials → API key → Server Key and click Create. Now you should see your API Key, copy it and paste it into the API Token field in the plugin. The free amount of searches is unfortunately limited to 100 a day by Google. If you need more than that you would have to buy a larger plan here.